Khmer food is so different from Western food, that all of the things we have been eating for the past 3 weeks deserve their own blogpost! I have been surprised at how similar, but very different (aka same same but different! ), the food has been between Vietnam, Thailand and Cambodia. 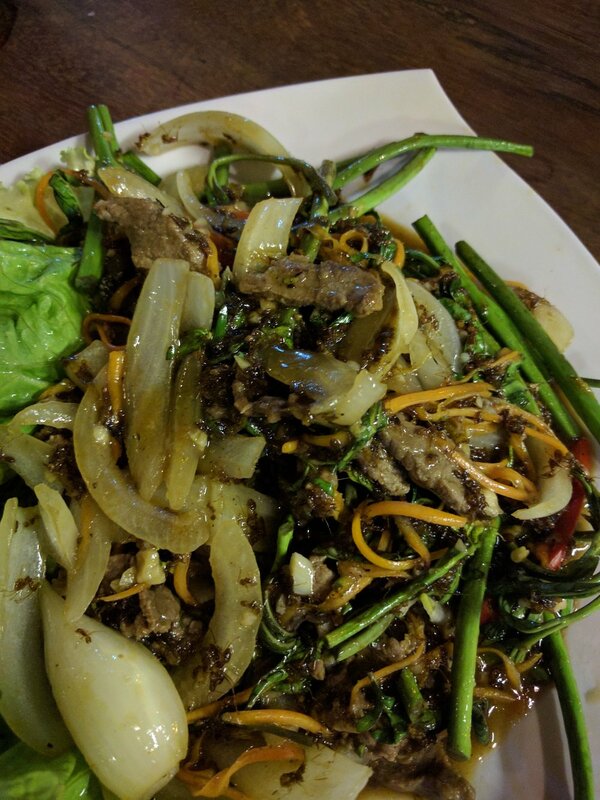 Here we have been eating a lot of Lok Lak, which is a traditional beef dish. Its varies everywhere you go! It is marinated beef that is served in a tomato sauce with rice. Sometimes you get an egg on top! Another traditional Khmer dish is Amok. Amok is usually served with fish (although you can order it with other types of meat). Fish is popular in Cambodia, but Jeff and I haven’t been eating much of it. Both of us are too lazy to pick all of the meat off the bones since they are normally served whole. I wasn’t so sure what to expect from fish amok, but wanted to try it! I was pleasantly surprised! It ended up being one of my favorite Cambodian dishes. It is a light-yellow coconut curry with fish and vegetables, served with rice. I also ordered it quite a few times with chicken- delicious! 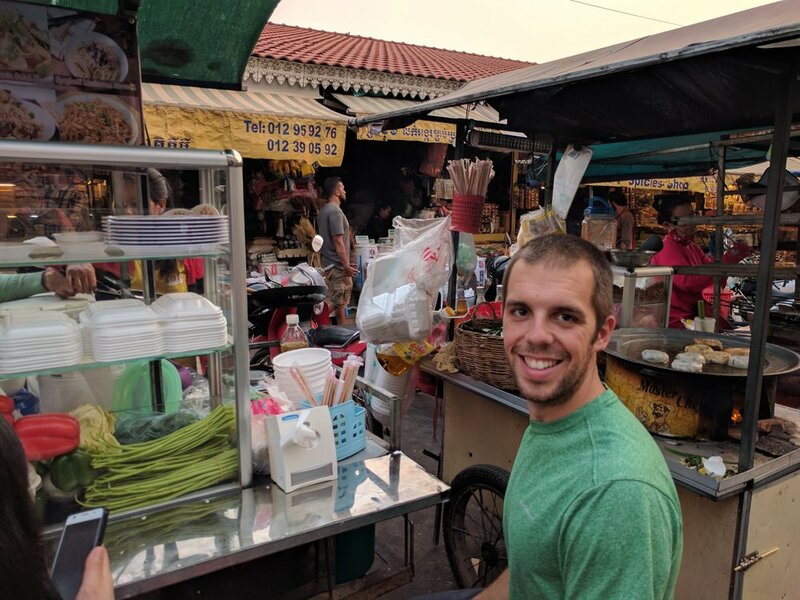 The street food scene isn’t as good as it was in Thailand, but Jeff and I walked around Siem Reap until we could find budget friendly options that would fill us up. As carnivores, we judge a good street food scene based on the amount of meat available. Meat on a stick was popular in Thailand, but finding grilled meat is harder to do in Cambodia. On Valentine’s Day we spent a very romantic night visiting multiple food stands and eating in the street. We spent a whopping total of $4 and got: fried noodles (2 different dishes), 1 fried leek cake, fried coconut balls and 2 bottles of water. 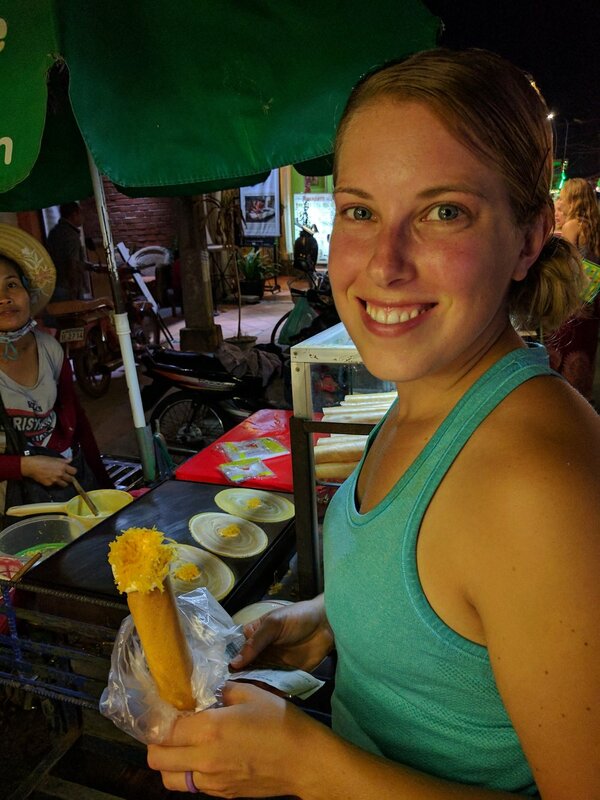 There is plenty of other street food available, even if there isn’t as much meat on a stick as we would like to find; some of my favorite things are the pre-cut fruit you can find all over SE Asia. 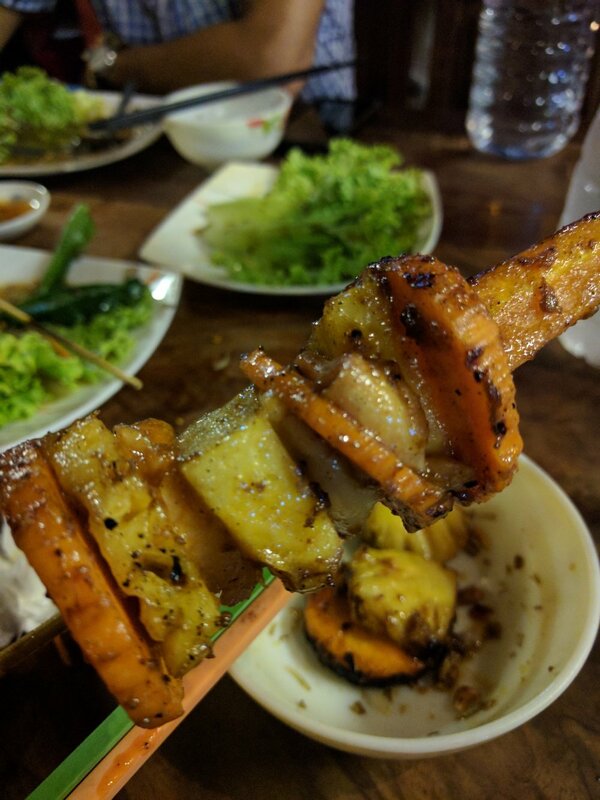 In Cambodia I loved the pineapple, cut right in front of you! One of our most authentic meals was lunch on our first full day of seeing the temples. We told our tuk-tuk driver that we wanted to get some local food. So, he stopped at a little roadside shack! (Shack is a generous term, perhaps ‘lean-to’ is more appropriate.) The ladies who ran this stall had already cooked multiple dishes, and we just walked up, looked in each pot, and then pointed to what we wanted. We both chose rice with vegetables and meat. Don’t ask us exactly what it was, the lady didn’t speak English, but it was pretty good! We also think there were some jokes made about white people eating on the side of the road - but since the conversation was in Khmer, I’ll assume they were just complementing our food choices…. On our second day of visiting temples, we ran into Isaac. He is from California, but is traveling after serving in the Peace Corps in Botswana. We had a great time chatting with him about his experiences and exchanging travel stories. I know it’s common for us to thank members of the military for their service (rightfully so! ), but I’ve never heard anyone specifically thank Peace Corps volunteers. Thank you all of you who have served, or are serving in the Peace Corps. Your passion, dedication and wiliness to help other cultures truly makes the world a better place. We met up with Isaac a few nights later for dinner at a local Khmer BBQ place. $10 bottle of wine, $4.50 for tortilla chips, and $4.50 for salsa. Worth it! For the record, we started with $5 worth of meat from the one good grill cart we found in town. We are really going to miss being able to eat on the side of the road whenever hunger strikes. And being able to do it for so cheap!